A few months back there was a long argument happening on one of the Filipino PC Communities on Facebook. If you wanna see the discussion, i’ll just leave the link here. Basically what happened was there was a guy who said that the GTX 1060 3GB is just an overclocked GTX 1050 Ti 4GB and that people should just buy the GTX 1050 Ti instead because the 3GB version of the GTX 1060 is just a waste of money. And he was really defending it and even bringing out some references from YouTube. So from there everything went hell and the rest is history. I know I’m super late in making this blog post as I promised the group that time that I will bust this “myth” personally. To keep things as close as possible, I will use Graphics cards from the same manufacturer. Huge shout out to GALAX Philippines for our graphics cards, the GALAX 1050 Ti EXOC WHITE 4GB and GALAX GTX 1060 OC 3GB. 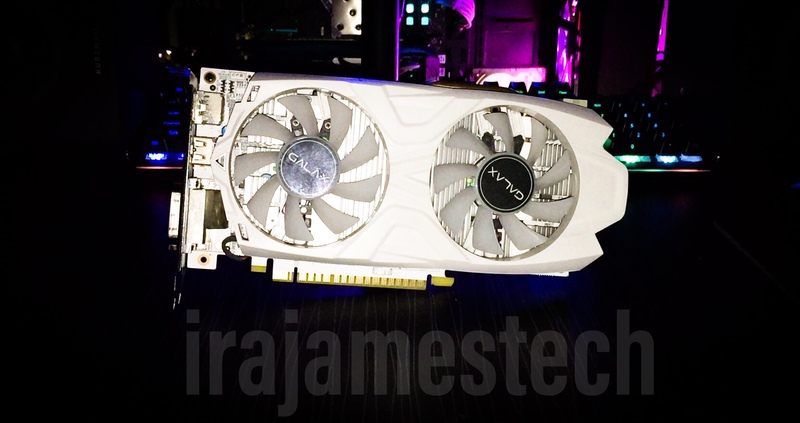 First are the GPU variant. The GTX 1060 3GB uses the GP106 which has a larger process size and more transistors compared to the GTX 1050 Ti’s GP107 chip. It has a higher GPU clock and Memory clock than that of the GTX 1050 Ti. And by higher, I mean significantly higher which means that the performance is going to be different than the GTX 1050 Ti. As for the memory size, even though the GTX 1050 Ti has a higher memory size of 4GB, the memory bus and memory bandwidth of the GTX 1060 3GB is also significantly higher. So obviously, the performance of both cards are going to different as well. And I’m sure most of you reading this will put it hands down that there is no point having both of these cards against each other. With that aside, lets get on to the test. 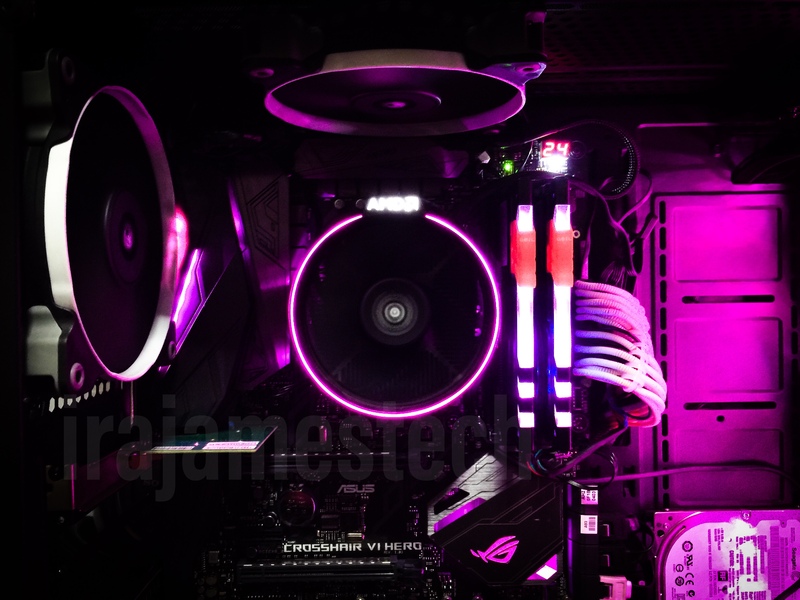 For testing, we will be pairing both graphics cards with the Ryzen 5 1600 and 16GB of 3200mhz DDR4 Memory on the ASUS ROG Crosshair VI Hero X370 motherboard. In this test, we’ve also overclocked the GTX 1050 Ti as high as we could with the MSI Afterburner. 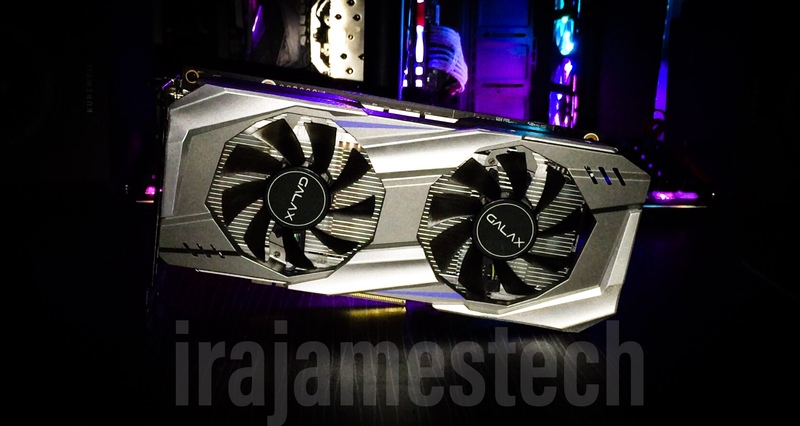 The Galax GTX 1050 Ti EXOC White is already a factory overclocked we could only reach up to +100 on the GPU clock and +500 on the Memory clock for a stable performance. First up is 3D Mark’s Time Spy and Fire Strike benchmark. Do take note that I’ll only show the GPU score and not the total score of the system as a whole. 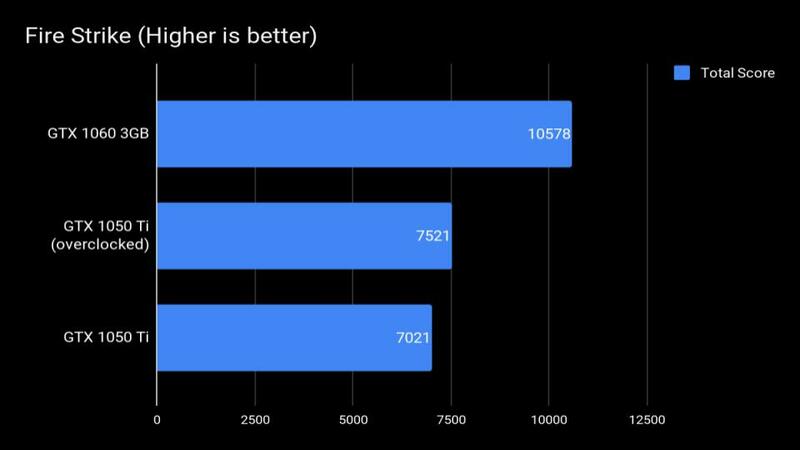 As you can see on the Time Spy results, the GTX 1060 3GB is scored a 41% higher GPU score than our overclocked GTX 1050 Ti. And the difference between our stock and overclocked GTX 1050 Ti is only 7%. Next up on the Fire Strike results, the GTX 1060 3GB is scored a 40% higher GPU score than our overclocked GTX 1050 Ti. A really small difference from the Time Spy benchmark. The difference between our stock and overclocked GTX 1050 Ti is also 7%. Here, we opted to only test only one game since it’s already obvious what the end results are gonna be. So with that, we fired up our most GPU intensive game in our library as of the moment, Tom Clancy’s Ghost Recon: Wildlands. We played it at 1080p resolution using the High preset. 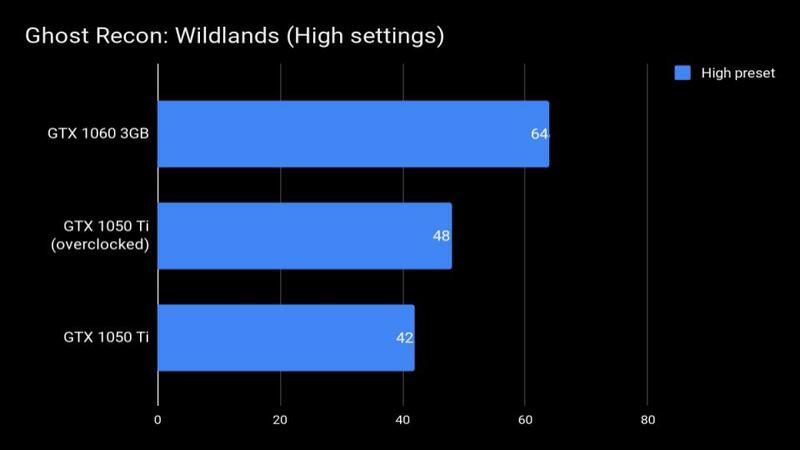 The GTX 1060 3GB is had 33% higher FPS than our overclocked GTX 1050 Ti while the difference between our stock and overclocked GTX 1050 Ti is also 14%. 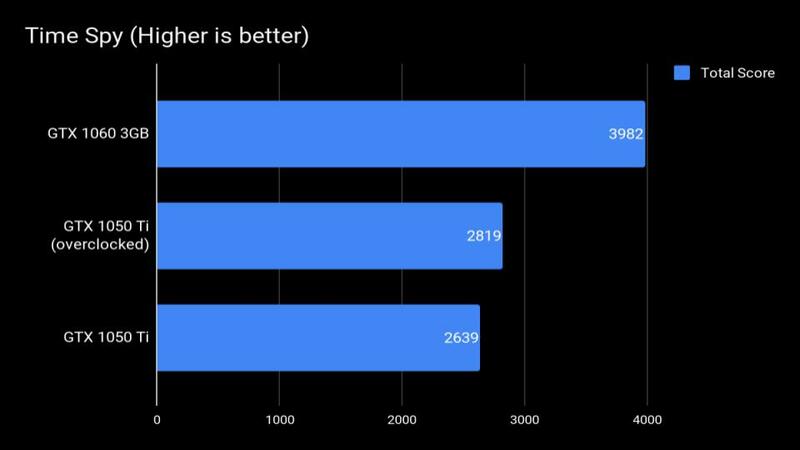 With that, we are not going to argue that the GTX 1060 3GB is just a glorified GTX 1050 Ti. As you can see here, the GTX 1060 3GB is way ahead of the GTX 1050 Ti in terms of raw graphical power. Even if we overclock the GTX 1050 Ti as much as we could, it doesn’t equal the GTX 1060 3GB’s stock performance.